Skin aging is a complex biological process that results from intrinsic but also extrinsic factors of which exposure to UV irradiation is the predominant cause. Other external factors include exposure to low humidity, cold and wind exposure, pollution, allergens as well as fatigue, and pathogens. Besides, skin can be affected by immune diseases such as psoriasis or atopic dermatitis. All these factors can alter the cutaneous barrier (the microbiome as well as the chemical, physical, and immune barriers) primarily formed by the epidermis (consisting of keratinocytes, melanocytes, and Langerhans cells) as well as the dermis where the fibroblasts produce the extracellular matrix. Therefore, several strategies have been exploited or are in development to prevent or treat skin aging. This article aims to give some examples of what has been developed in Erdyn’s network or published. Microbiome: While the microbiome is a significant determinant of health, it can also contribute to human appearance. Several approaches to microbiome skin care coexist: removing bacteria through traditional cleansers and spot treatments, prebiotics to promote « good » bacteria, probiotics to add « good » bacteria, postbiotics to add by-products of bacteria. From microbiome-friendly cleansers and moisturizers to probiotic skin care products, there are several on-going innovation opportunities. For example, a topical formulation comprising specific beneficial microbes that can excrete UV absorbing materials was patented in 2018. This solution offers an alternative to sunscreens that usually contain antimicrobial active ingredients likely to remove many indigenous beneficial microbes. Another example of opportunities in the skin microbiome area is the therapeutic probiotic developed by AOBiome Therapeutics. Their clinical-stage products harness a single strain of class-defining, Ammonia Oxidizing Bacteria (AOB) to address acne and eczema among other conditions. New ingredients for immunomodulation: Keratinocytes through cytokines production and other skin-resident cells such as Langerhans cells create an immunologic barrier that is poised to determine the appropriate adaptive immune response to breaches in the skin’s physical barrier. However, external agents can deregulate this immunological barrier. Pollution like urban dust or skin diseases like atopic dermatitis and dermatitis are known to modify the cytokine production for example. Therefore, several strategies are used to decrease inflammation and immune answer from topical creams with corticosteroids and immunomodulators to phototherapy. Research led by the Blaise Pascal University (France, Clermont-Ferrand) has led to the discovery of sulfated polysaccharide extracted from red algae that can prevent the unwanted secretion of VEGF by the keratinocytes in indications such as rosacea, atopic dermatitis, eczema, psoriasis, acne or skin redness. Another example of innovation is the topical active developed by a US start-up able to block pollution‐induced toxicity and inflammation to help slow skin aging. Their ingredient outperforms the action of traditional active components used in antipollution skin-care products such as niacinamide, ascorbic acid or α-tocopherol. The ingredient can clinically improve the appearance of facial skin aging including fine lines and wrinkles, skin texture, skin clarity/brightness, and firmness/elasticity. In particular, their active ingredient has been shown to block pro‐inflammatory cytokine release triggered by several different environmental stimuli such as UVB, chemical, bacteria, metal, TLR agonists and T‐cell receptor‐induced inflammation. Chemical barrier: The epidermis acts as a chemical barrier thanks to antimicrobial peptides and reactive oxygen species from keratinocytes, anti-oxidants, ROS scavengers, and melanocytes. Melanocytes are associated with skin pigmentation through the synthesis of melanin within melanosomes that are then transferred to neighboring keratinocytes. Inflammation in chronic skin disorders such as psoriasis or atopic dermatitis is often associated with pigmentation disorders. Researchers from the University of Bordeaux have identified a core molecule involved in melanocytes detachment responsible for depigmentation in post-inflammatory skin disorders in particular. They have established a proof of concept in a 3D-induced depigmentation model. Physical barrier: Epidermal keratinocytes that are capped by a nonvital cornified layer and joined by a network of tight junctions constitute a physical barrier that, under normal circumstances, prevents entry of many environmental agents and dehydration. The cornified layer is the result of the differentiation of keratinocytes into corneocytes. During this differentiation, the cell membrane is replaced by the cornified envelope that consists of proteins surrounded by lipids, crosslinked by transglutaminases forming a macromolecular complex particularly stable, insoluble and impermeable. The correct formation of the cornified envelope is essential for the barrier function of the skin. Therefore, cosmetics and pharmaceutical compositions frequently incorporate active agents targeting biological targets involved in the skin regeneration process, particularly in the differentiation of keratinocytes, the epidermal lipid synthesis and the cohesion of the corneocytes. 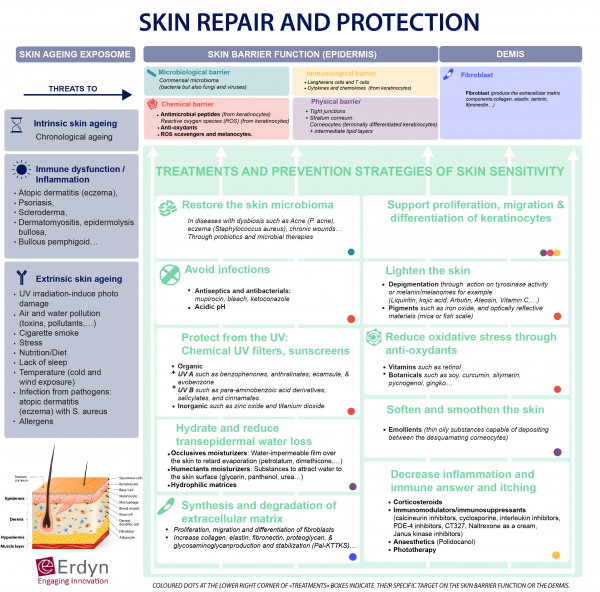 For example, researchers from the University of Toulouse (France) have developed an approach to support the skin barrier function after their analysis of the transcriptome of the human genes implicated in epidermal barrier function. They have identified active peptides sequences (5 to 15 aa) from a polypeptide (80 aa) that belongs to a new group of the «Late Cornified Envelope» (LCE) family to prevent or treat skin disorders such as xerosis, ichthyosis, psoriasis, keratosis. The LCE cluster contains multiple conserved genes that encode stratum corneum proteins that will be incorporated into the cornified envelope by the action of transglutaminase. The researchers have shown in vitro bonding evidence to transglutaminases 2 and 3. In a nutshell, skin-aging is a complex biological process, and multiple pathways can be targeted to prevent or repair it. Stay tuned for more articles on cosmetics and Life Sciences and feel free to contact us to see how we can help you with your cosmetic projects. Erdyn is seeking a service provider for a regulatory watch regarding the use of microalgae in the food, feed and cosmetics sectors. La convergence économique, une réussite de l’Union Européenne ?